Motorola has finally and officially announced its latest budget smartphone, the Moto G. The MotoG comes with amazing specs and feature, specially at an budget price. There are few phones in the market which offers such specifications for $179, specially from big Company’s. The new G will compete with midrange smartphones. Apart from the its LOW price, the handset has 4.5inch HD display and runs on Android 4.3 Jelly Bean OS with upgrade to Android 4.4 Kitkat soon. The new Moto-G has 4.5inch edge to edge display having 1280 x 720 pixels resolution with Corning Gorilla Glass protection. The handset is powered by 1.2GHz quad core Qualcomm Snapdragon 400 processor integrated with Adreno 305 GPU to make the phone smooth and snappy. For photography there is 5-megapixel primary snapper with LED flash and a 1.3megapixel front camera. The MotoG is capable of recording and playing (playback) 720p HD videos at 3o FPS. 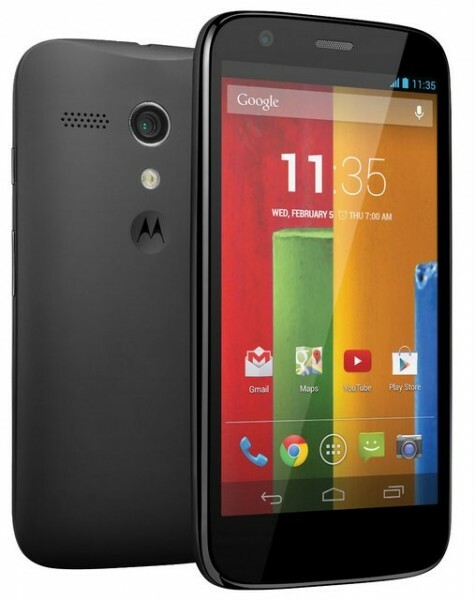 The phone has round edges and looks very similar to Moto X. The Moto G is 6.0 to 11.6mm thick and weighs 143 grams. The handsets packs with 2070mAh battery and features 3G, 1GB RAM. The Motorola Moto G comes with seven flip covers and Grip shells in five colors. The price of the 8GB variant is set to $179 while the 16GB model is priced at $199. The phone will be priced around RS12000 in India. The phone will be first headed to Brazil and parts of Europe and Latin America, Canada and Asia will follow the same. It will be available in US, India and other parts of Asia in January 2014. The Moto-G will be available in more than 30 countries with 60 partners by next year, said officials.